Cut Copy get slower and looser on their third album. Yes, we're talking about the same Cut Copy. Australian neo-synthpoppers Cut Copy were always going to face an uphill battle with the follow-up to their rightfully adored, near-perfect sophomore album In Ghost Colours, an album that sat atop the list of PopMatters’ Top Electronic Albums of 2008 and was one of the top 10 overall albums for PopMatters and various other publications that year. While Ghost Colours II would have likely upset no one, making lightning strike twice is a very hard thing to do indeed. Much of the aforementioned album’s magic was thought to come courtesy of superstar producer Tim Goldsworthy (The DFA, UNKLE), who added an ecstatic fluorescent sheen to the proceedings and who has not returned for this year’s Zonoscope. Without Goldsworthy’s aid, the band’s 2004 debut album, Bright Like Neon Love, was frankly not very good. Therefore, it would follow that whatever Cut Copy put out next after In Ghost Colours would be an indication of whether they learned anything under Goldsworthy’s tutelage or whether they need assistance standing on their own two feet. Under the direction of frontman Dan Whitford, Zonoscope is the ultimate test. The first taste listeners got was "Where I’m Going", a glorious little single that dropped in the summer of 2010 and appears pretty much unaltered here. The opening lyrics beseeched its audience to "Take my hand if you know where I’m going to", but it’d be pretty hard from this cut alone to have any clue where the destination was. The band seemed to abandon any notion of itself as a neo-rave force of faction (or a "Blog House" act as the unfortunate and thankfully short-lived moniker would have it) and was instead intent on making big powerpop rock anthems backed by glistening synths. Its chorus was powered by a Gary Glitter stadium stomp call-and-response of hooting yelps of "Yeah! ", affirmations all with no trace of the detached irony and libidinal depletion of the "yeah yeah yeah"s of LCD Soundsystem’s "Yeah". "Everybody keeps on talking about it/ Nobody’s getting it done" other DFA guy James Murphy said in the latter tune, but here were Cut Copy, seemingly getting it done (possibly even getting ‘r done), hybridizing a pop format that simultaneously seemed to reviving D.O.A. rock 'n’ roll, bringing it into the 21st century, and making it agreeable to the indie kids by adding weird flourishes like the blissfully psychedelic arpeggio breakdown and the opening guitar loop, which seemed to suggest a sequel to the Velvet Underground’s "I’m Waiting For the Man". In some alternate universe where the radio still mattered, this would have been a chart smash that you couldn’t enter a pizzeria or a Guitar Hero session without hearing. Luckily, "Where I’m Going" is not the template for Zonoscope (in fact, it’s a bit of an outlier). It’s not that the group don’t do the hoot-and-holler singalong summer jam exceedingly well, but as the more infectious cuts off of In Ghost Colours ("Lights and Music", "Hearts on Fire", pretty much every vocal track) proved, it’s the way Cut Copy fills the spaces around those enduring hooks that keeps them resonant beyond a couple of spins. So, interestingly enough, Zonoscope goes against the grain and against the halo-soaked yet tightly compressed fist-pumping suggestions of "Where I’m Going" and churns out an album that is, in parts, loose and jammy. Which is not to say the band has lost its interest in shimmer. There’s still tons of twinkling tidbits lingering about. The vaguely island syncopation and rubbery bass of "Take Me Over" announce a Cut Copy that’s about as close as a Cut Copy can get to yacht rock. Yet, it’s the good kind of yacht rock (think the English Beat’s "Save It For Later" or Hall and Oates’s "I Can’t Go For That") filtered through a house idiom, too energetic to be Balearic and too synth-happy to be Vampire Weekend. "Alisa" is another example of the band’s persistent attraction to glitter-soaked luminescence. One of the most rock-ish songs on Zonoscope, "Alisa" contains riffs that are actually rather jagged and off-tempo, but its wailing tremolo could be mistaken for any number of neo-shoegaze outfits to emerge in the last decade or so (Serena Maneesh, Stars, Voyager One, etc.). Count on vocalist Dan Whitford to turn the mundane transcendent through a fervent chorus lament of "A-leeeeeesaaaaaah". It’s those irresistible choruses with their dire insertions of purely musical phrases like "oooh" and "hey" that made each gem from In Ghost Colours a candy confection, and it’s them that save Zonoscope from drowning at points. Despite a few propulsive moments, Zonoscope is marked on the whole by slower tempos. In a 140 BPM world, Cut Copy have dared to step back into 120, even 100 BPM territory, which has a significant affect on Whitford’s vocals. Though he’ll perhaps never be known as a great singer, Whitford has nonetheless gone through an evolution. On Bright Like Neon Love, his flavorless and dry vocals dragged down the rest of the music, unfairly lumping its pure pop leanings in with electroclash. By In Ghost Colours, Whitford had found a workable strategy; mimic New Order’s Bernard Sumner. Though Sumner himself was never a particularly stirring frontman, he’s an expert in sublimating his blandness by binding himself to the hook, forcing a recombinant DNA strand stronger than the sum of genetic makeup. The same can be said for Whitford. Easing the pace though seems to enervate Whitford, who only seems able to rise into a leadership position when the music motivates him. This is unfortunate since many trancier cuts like "Pharaohs and Pyramids" and 15-minute closer "Sun God" are clearly intended for the festival circuit and do deliver the goods, musically at least. Fading into the backdrop would be fine for Whitford if Cut Copy were a more communal jam band, every member an equal instrument. However, this is one act that truly does work best in a traditional pop arrangement. The worst effect of this change is when Whitford tries to compensate on "Corner of the Sky" and "Blink and You’ll Miss a Revolution" by assuming a cartoonish low voice, a kind of inverse falsetto. 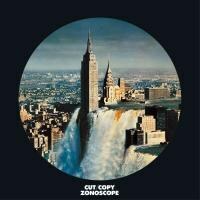 Still, Cut Copy retain the ability to stun even if they lack the resolve to mystify. The fantastic bookending tracks, "Need You Now" and "Sun God", occupy a good deal of the total track time, but dominate the overall ambiance of Zonoscope. On "Need You Now", Whitford channels OMD’s Andy McCluskey circa Dazzle Ships rather than Sumner as those fluttery synth loops from some lost '80s corporate television ident card mount an incredible tension that mounts so unconsciously that the listener doesn’t even realizes he or she needs that drum fill to break the tension and carry the track on out. "Sun God" is the 3 A.M. incantation, the time when the floor clears up space and thus the music can too. There’s a Screamadelica-referencing invocation to "Come together as one" here, but the sluggish and hypnotic arpeggiating sequences remind me more of the similar work on Blondes’s overlooked 2010 gem Touched, a series of brain-tingling patterns as sensual as they are mathematical. After taking three years between this album and In Ghost Colours and four years between the last two, Cut Copy have shown themselves to be assiduous in their vision and more or less indifferent to trends. The title "Blink and You’ll Miss a Revolution" may even be a sly dismissal of music’s current rate of adoration and disavowal. Cut Copy are now standing on their own and doing quite well considering that they completely altered their approach. It’ll be interesting to see if they can work out the kinks by their next outing or whether they’ll be on to something completely different by then. For now, Zonoscope is a deviation with mostly good ideas, some great ones, and enough sparkling synth ambrosia and sing-along chorus hooks to get you through. I could certainly think of worse ways to spend my time in the strobe light.